Step Away From the Cake: So many things running through my head right now. So many things running through my head right now. 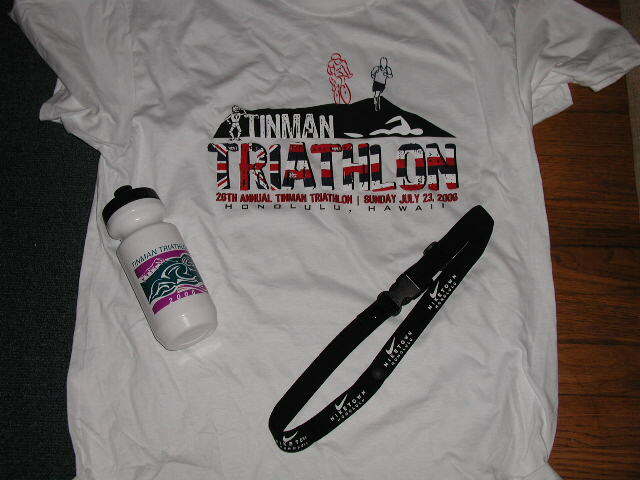 There is of course the obligatory t-shirt, who can't use another water bottle, and a race belt. I'm very excited about the race belt since I didn't have one and seemed to keep forgetting to pick one up. It's one of those things I would think about as I was getting ready for a race and then promptly forget it after the race was over, so I'm stoked. There will also be finisher's shirts and medals - woohoo!!!! In reading the race rules last night I got a little freaked out though. The start is in waves and I'm in the 2nd wave. That's good in that I don't have to wait long. That's bad cause there's 3 waves behind us. The swim being the hardest part (mentally) for me, I've begun some mind games. I have taken some of the things from WW and am applying them to this. I have a talisman that every time I touch I think how good a swimmer I am and how I do not freak out in the water. I'm also mentally picturing the swim and seeing myself swimming calmly and remaining calm throughout. I just need to get there early enough to have time to get in the ocean and warm up and get over the anxiety. I really believe I will do fine. Where the mind goes the body will follow. Swim clinic last night was awesome. The most important thing I've learned is that I am a good swimmer. I'm not that fast but I'm good. The instructor pointed out that on my recovery I tend to drop my left elbow and it actually hits the water before my hand does. I worked very hard to stop doing that and I'm having a hard time. It's almost like my shoulder doesn't move in the right way. It's weird but I'll work on it. He liked my catch, says I'm doing that really well. Also, he loved my extension, says that's really coming along. So it was good. I'm debating about joining a master's swim class once my tri is over. There are a couple that are near me and I'm thinking about it. There's one not far from my house at 7pm most nights and there's one near my work M-W-F at 5am. Either one would probably work out fine. Something I need to think about. I wouldn't start till after my clinic ends and my tri is over so not before 7/31. Which brings us to this morning. I did not want to get up but I forced myself. I've kind of moved into a taper. The way I figure is, the work is done, nothing I do now is going to make me any faster or stronger so I'm not risking injury. So I finally go up this morning and couldn't decide what to do, elliptical, yoga, pilates, what???? Finally I decided I really felt like a bike ride. So I headed off and just took it easy, I was just cruising enjoying the morning. A couple of things I noticed. My average speed, without really trying, was over 13 mph. Granted, that's not the speedyist ever but I wasn't trying. I was in the easiest gear the entire way, enjoying the scenery and just having a great time. If I had put the hammer down I could have averaged 14-15 mph, very cool. Also, I did 8.4 miles in 40 minutes. That's pretty good for cruising. I have never done that ride that fast with that little effort. I never even worked up a sweat. So that was good. I guess that's it. I have some other things running around in my head but they are not fully formed ideas and therefore not ready for publication.